Watch the Video Yes. Real-time rates, label creation, and tracking with all major carriers. Agora offers rates only. Watch the Video Yes. Mobile Friendly Catalog & Checkout. M-Commerce not Available. Reliability Nexternal hosts and maintains the application with 24/7 monitoring Agora Cart is hosted by a third party. Reliability varies. Software Updates Automatic and frequent. Merchant must download and install Agora Cart updates. 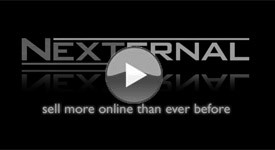 Keyword Rich, Search Engine Friendly URLs Yes, native in Nexternal.NET and with the Search Engine Friendly Catalog for Nexternal Classic users. No. Marketplace Feeds Yes. Automated - Run Daily No. Must Manually Create and Submit Data Files. Product Inventory Kits/Assemblies Supported Not Supported. HackerSafe / Scan Alert Included with shopping cart Not included. Multiple Admin Access Levels Yes. No. Multiple Customer Types Yes. Control Product Visibility and Pricing by Type. No. Customer Reviews and Ratings Yes. No. Information was collected from AgoraCart's website (www.agoracart.com) in order to compare it to Nexternal's shopping cart application. To report an error or discrepancy, please email .